“Our theme was New York glamour. We spent nine weeks there over the summer of 2014 and had the most amazing time and Anthony proposed to me on the Brooklyn Bridge, so we decided to have that as our theme, naming the different tables after iconic landmarks of the city. We also had a beautiful candy cart with a replica Brooklyn Bridge and New York-themed cupcakes. Walking down the aisle I felt really overwhelmed with emotion I couldn’t look at Anthony because I knew I would burst out crying and I didn’t want to. Being at the altar saying our vows was so special and the best part of the day for me but I felt as if I was going to faint. Luckily I didn’t but we laugh about how serious I look on the wedding video. A really special moment for me was when an instrumental version of Elvis’s Can’t Help FallingIn Love With You was played at the church when we were signing the register. We both really love the song and lyrics but it was also a tribute to my beautiful grandma, Margaret ‘Peggy’ Crane who loved Elvis. I felt it was a way for me to include her in our special day and it is a moment that I won’t forget. As well as having the top table dressed with flowers and tealights we included a photograph of my grandma Peggy and my nan Muriel Corless in front of me. I stressed out quite a lot in the run-up to the wedding about things that just did not matter at all on the day. Try not to lose sight about what it is actually about because that is all that matters. It was the best day of our lives and all the planning is worth it. Kristina Said “I felt as if I was going to faint. Luckily I didn’t but we laugh about how serious I look on the wedding video”. We loved having the two Matts as our photographer and videographer on the day. They turned up so early and worked so hard all day. Matt Rycraft was the ultimate professional. 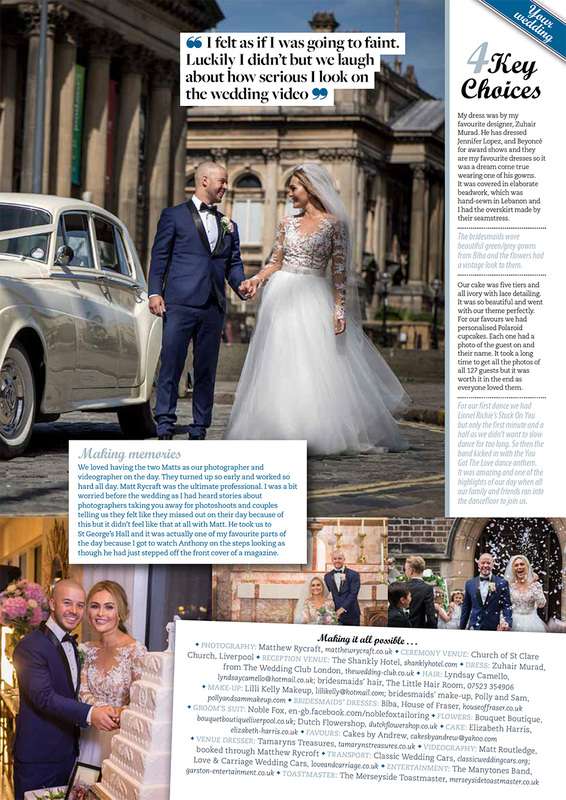 I was a bit worried before the wedding as I had heard stories about photographers taking you away for photoshoots and couples telling us they felt like they missed out on their day because of this but it didn’t feel like that at all with Matt. 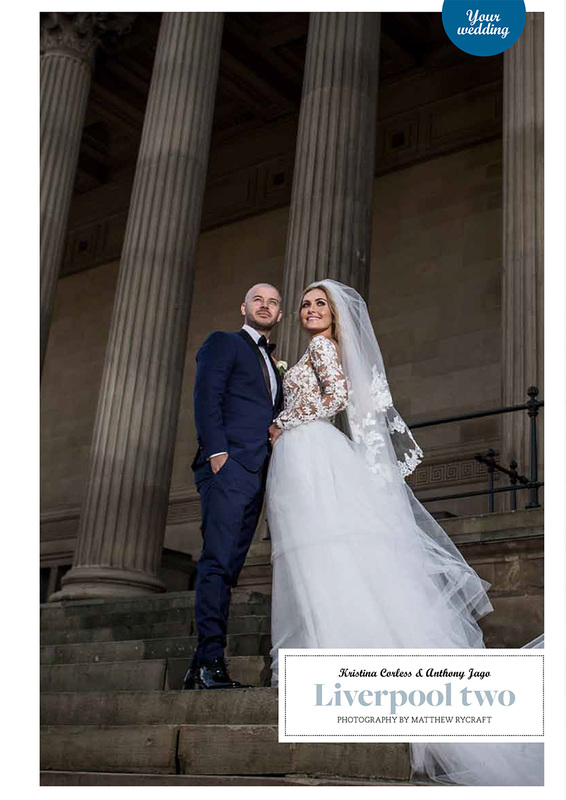 He took us to St George’s Hall and it was actually one of my favourite parts of the day because I got to watch Anthony on the steps looking as though he had just stepped off the front cover of a magazine. 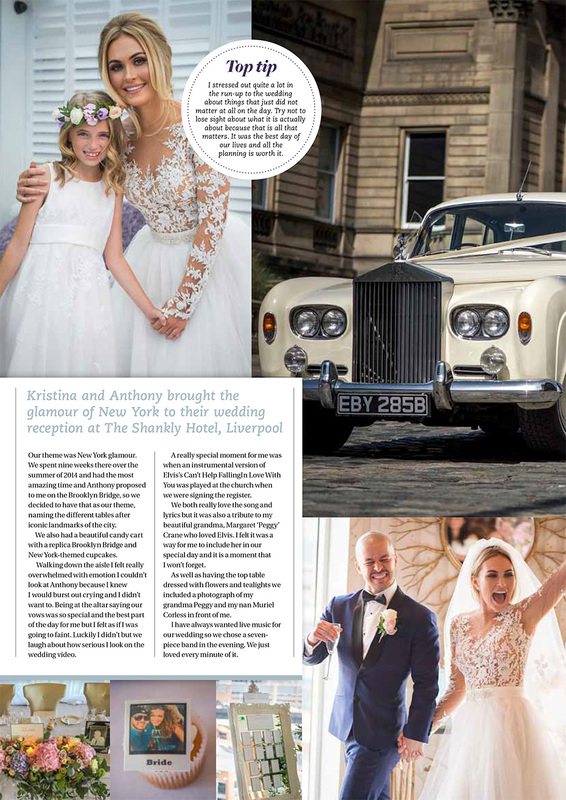 Their full wedding gallery can been seen at their wedding story, A Magical Wedding Day in Liverpool. ✦ My dress was by my favourite designer, Zuhair Murad. He has dressed Jennifer Lopez and Beyoncé for award shows and they are my favourite dresses, so it was a dream come true wearing one of his gowns. It was covered in elaborate beadwork, which was hand-sewn in Lebanon and I had the overskirt made by their seamstress. ✦ The bridesmaids wore beautiful green/grey gowns from Biba and the flowers had a vintage look to them. ✦ Our cake was five tiers and all ivory with lace detailing. It was so beautiful and went with our theme perfectly. For our favours we had personalised Polaroid cupcakes. Each one had a photo of the guest on and their name. It took a long time to get all the photos of all 127 guests, but it was worth it in the end as everyone loved them. ✦ For our first dance we had Lionel Richie’s ‘Stuck On You’ but only the first minute and a half as we didn’t want to slow dance for too long. So then the band kicked in with the ‘You Got The Love’ dance anthem. It was amazing and one of the highlights of our day when all our family and friends ran into the dancefloor to join us. Making it all possible . . .